EDAQS today announced the official publication of the DICE project, an innovative banknote system that solves thousands-of-years old problems and guarantees unforgeable banknotes, among other benefits. The DICE (acronym: Dynamic Intelligent Currency Encryption) procedure was developed to consequently solve all security-related complications of cash systems today, and to fight global criminality while protecting retailers and citizens. EDAQS today announced the official publication of the DICE project, an innovative banknote system that solves thousands-of-years old problems and guarantees unforgeable banknotes, among other benefits. The DICE (acronym: Dynamic Intelligent Currency Encryption) procedure was developed to consequently solve all security-related complications of cash systems today, and to fight global criminality while protecting retailers and citizens. 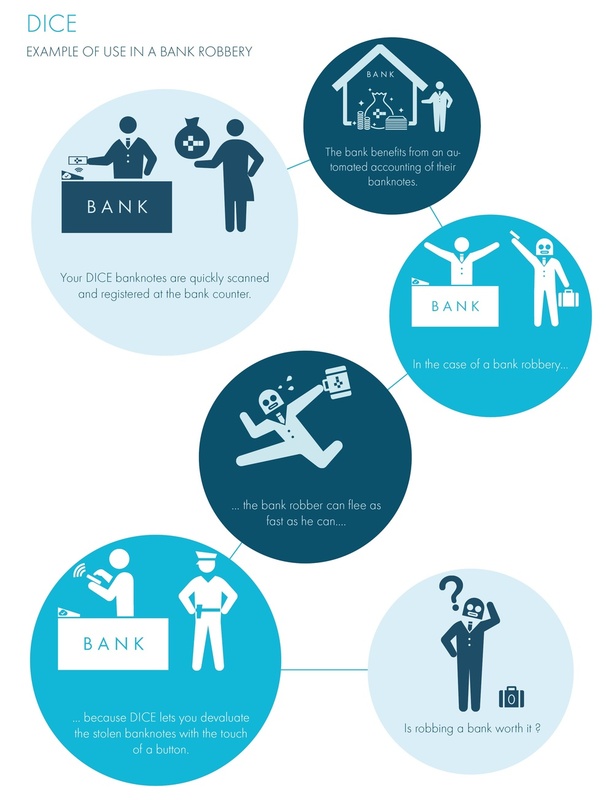 DICE is based on an identifiable banknote (RFID/Code) that connects to a digital security system to verify the banknote’s validity. A key feature is the ability to devaluate banknotes that may have been stolen from a DICE user or which are illegally circulating. This function, based on an automated and intelligent mechanism called RENODE that applies a large number of algorithms and heuristics, is the essential part in fighting crime that comes with cash. DICE also allows to fight drug cartels and terror financing on a totally different level by giving new options to remotely deactivate the banknotes and eventually track criminals after a robbery. “In the ten thousands of possible examples of use of DICE, we have always focused on the privacy of the citizen and our concept is still tailored to meet and respect our very high policies there. After all, the DICE’s credo is to protect and to give you safe freedom while fighting crime and respecting your privacy.” adds the inventor of the DICE. DICE is EDAQS’ first hybrid product that unifies artificial intelligence and the daily life, and has been classified as a “governmental reformation venture”, since an effective implementation could only be achieved through official ways and with the support from governments. The concept relies on the registration of banknotes through connected retailers, banks as well as everyone that has to fear offences due to the possession of a large sum of cash. The lightning-fast registration of the banknote through the DICE-cloud device does not influence the day-to-day business negatively, but furthermore gives full protection of the registered cash assets for any DICE-user. 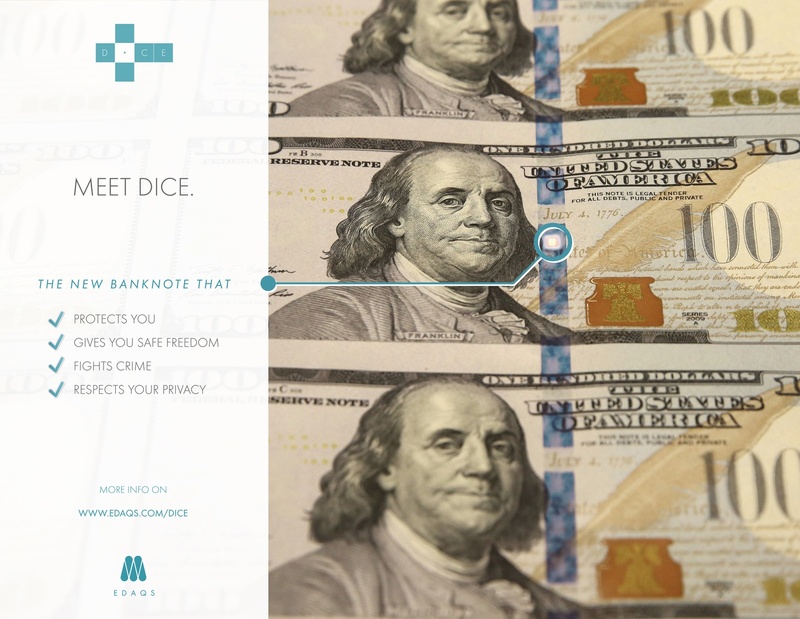 The application examples of DICE are numerous and range from the simple anti-counterfeiting of banknotes to the fight against terrorism. Furthermore, the security to have your cash assets registered to a centralized and safe system, protects you from losing it through other catastrophes, such as a fire or a flood. More information is available at http://www.edaqs.com/products/dice-cash-security-system/ . For media requests please contact press(at)edaqs.com. For more technical details and specifications as well as governmental requests, please contact the departments listed on http://www.edaqs.com/contact/ . EDAQS is a high tech company that combines the accuracy of automated computational systems with advanced Artificial Intelligence to provide more transparency and the uppermost precise hi-tech systems.